The air was hot as we stepped outside Kahuli Airport, Maui, but who wouldn’t love that if it means you’re standing in the sunshine of a Hawaiian island. 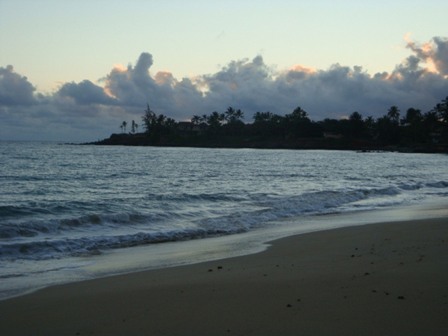 We traveled about six miles on the local bus (just $1 per boarding, regardless of the distance) to the beachside town of Paia. The bus stop is made from half a wooden palette resting on plastic milk crates. 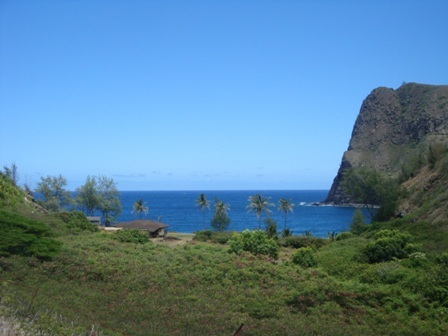 The whole town is probably less than a quarter mile long on this beginni ng stretch of the Hana Highway, with small gift stores, restaurant cafés, surfing rentals and beachwear shops making up most of the businesses here. We chose Paia from a random Google search for hostels near the airport and stumbled upon a place that became the highlight of our Hawaiian adventure. Maui’s key attractions. It’s the meeting spot for many downhill volcano biking adventures from the top of the Haleakala volcano crater, the last town before you drive the treacherous, winding, yet must-be-done road to Hana, and home of Ho’okipa beach, one of the best wind-surfing locales…on an island that’s world famous for its perfect wind-surfing conditions. Yet it’s on the other side of the island and a world away from the high-end resorts that can mask the true 24/7 island experience. We were unprepared, short on time and without a car, but in this case throwing ourselves to the winds of chance brought the best results. Our hostel was on the only other road in Paia, bordering the cane field that supplies the local sugar mill industry. The bright, multi-colored weatherboard house is fittingly titled Rainbow Surf Maui Hostel. Its basic but clean accommodation is all a traveling adventurer needs, with homey friendliness thrown in for free. Another great thing about this hostel is the native-Hawaiian owner Riki, who is passionately fighting for the rights of his people after their long history of abuse by conquering Westerners. Riki took time to climb a coconut tree, crack me open a fresh shell to drink from, and tell me all about the secrets of the stars. “Do you want to look at them from a white man’s way or from a Hawaiian’s way?” Definitely Hawaiian. As Australians we rounded out the multi-culturalism of the group and got the ‘as good as a local’ knowledge of where the sea turtles hang out from Gregor, who’d been on Maui for three months already. We spent the day at the Kamaoele beach park snorkeling and paddle-boarding with eight giant sea turtles just centimeters away. It beat any organized tour I’ve ever been on. There are a few different ways to do Maui, but I’d suggest that if you want to get to know the heart and culture of a place then you’ve got to get right in the middle of it. Paia is the place to do that.